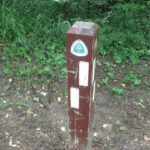 The roughly three-mile section of the Appalachian National Scenic Trail that runs along the Chesapeake & Ohio Canal National Historical Park towpath from Weverton, Maryland, to Harpers Ferry, West Virginia, provides many sights and sounds for visitors to enjoy. Visitors to the area can experience incredible biodiversity by listening to different types of birds or looking at interesting species of flowers and other plants. They can also see an amazing number of historical artifacts and structures, such as the remnants of a stone house that used to be attached to the popular Salty Dog Saloon. 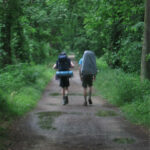 As the Appalachian Trail follows the C&O Canal and its towpath upstream, it's nestled between the Potomac River to the south and the Baltimore & Ohio Railroad to the north, demonstrating the various modes of transportation used in both past and present. The B&O Railroad was one of the reasons the C&O Canal was eventually rendered obsolete, as it was faster to transport goods via rail than canal boat. 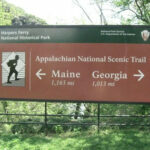 The Appalachian Trail, or the AT as it's affectionately known by many, then continues across the Potomac River into the town of Harpers Ferry, which serves as a rough midway point on the AT - it is 1,165 miles north to Maine and 1,013 miles south to Georgia. 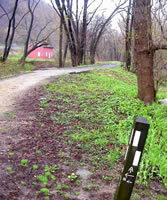 The headquarters for the AT and Appalachian Trail Conservancy are both located in Harpers Ferry. 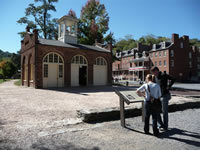 Harpers Ferry provides hikers with a chance to take in some fascinating historical sites from the Civil War and other eras. Some of the sites include Jefferson Rock, the site of John Brown's raid on the federal arsenal, and the ruins of St. John's Episcopal Church, which was built in 1852. 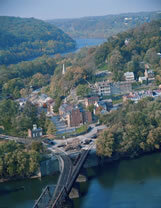 To reach Harpers Ferry, you cross over the Potomac from Maryland to West Virginia on an old iron bridge that was built in 1893 and runs parallel to the railroad tracks that come out of the tunnel, built in 1931. 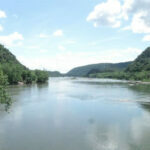 All of these factors make the AT from Weverton to Harpers Ferry a destination on the C&O Canal that has plenty to be cherished and discovered, whether you're looking for natural wonder or historical significance.